1. Preheat oven to 250�F. 2. Line the bottom of a 9-inch square baking pan with parchment paper. Set aside. 3. Place egg yolks, sugar and vanilla in a mixing bowl and whip with a whisk until it is pale yellow and thickened. 4. Meanwhile, place chocolate in a small mixing bowl over a pot of simmering water to melt the chocolate. Mix periodically. Once melted, remove from heat and add butter. Stir until smooth. 5. Fold the chocolate mixture into the yolk mixture. 6. Place the egg whites into a clean, dry electric mixing bowl. Using the whisk attachment, beat the egg whites just until firm peaks form. Be careful not to over beat. Fold egg whites into the yolk/chocolate mixture. 7. Pour mixture into the prepared cake pan. Bake for 90 minutes or until firm to the touch. Remove from oven and let cool in the pan on a cake rack. 8. To serve, place 1/2 cup of berries in the middle of each plate. 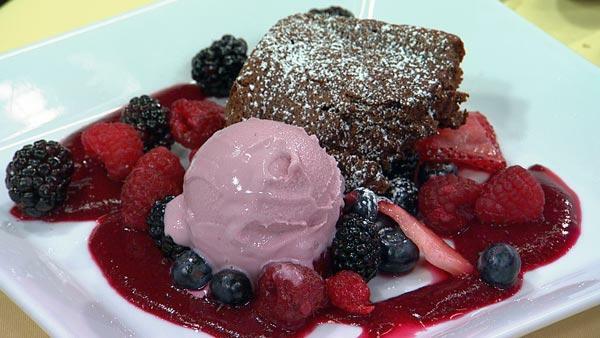 Pour mixed berry coulis around it and top with a piece of cake. Serve with a small scoop of sherbert or sorbet. 1. Place berries, juice, and sugar into a blender. Process until smooth. 2. Taste and adjust sweetness with the additional sugar if necessary. This coulis will last for 2 days in the refrigerator in an airtight container.